Chocolate lover's rejoice! 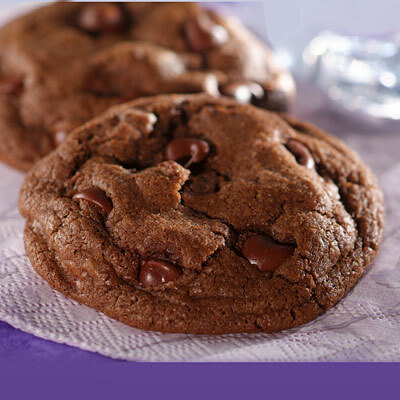 These cocoa cookies are filled with chips for a double dose of chocolate. COMBINE flour, cocoa, baking soda and salt in a small bowl. Beat butter, brown sugar, granulated sugar and vanilla extract in a large mixing bowl until creamy. Beat in eggs for about 2 minutes or until light and fluffy. Gradually beat in flour mixture. Stir in morsels. Drop by rounded tablespoon onto ungreased baking sheets. BAKE for 8 to 10 minutes or until cookies are puffed. Cool on baking sheets for 2 minutes; remove to wire racks to cool completely.